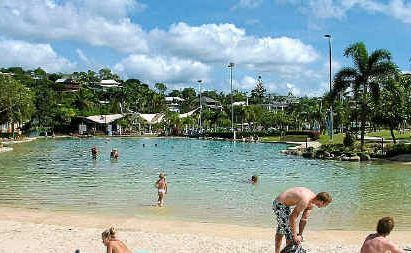 TAKE A DIP: Airlie Beach’s man-made lagoon is central and a popular place to swim and sunbake. IT is a typical Saturday morning at Airlie Beach on northern Queensland’s Whitsunday coast and the beachside market, offering the usual mix of farm produce and local handicrafts, is in full swing. Further along the waterfront, cafes are filled with tourists, many of them backpackers, who spill out onto the pavement enjoying breakfast under the tropical sun. This is the Whitsunday coast after the recent cyclones. Locals want you to know that it is business as usual. The cyclones really did only minor damage to the Airlie Beach township and the 74 islands that make up one of Queensland’s – and Australia’s – most favoured holiday destinations. Only Hayman Island suffered any major damage and this resort will open again in August, bigger and better than ever. Brampton Island Resort is also closed for refurbishment. The Whitsundays is the largest group of offshore islands in Australia. The sparkling azure seas are filled with national park islands, eight resort islands – the only inhabited islands – and coral cays, fringing coral reefs and stunning beaches. Colourful and cosmopolitan, Airlie Beach on the mainland peninsula, halfway between Brisbane and Cairns, has long been backpacker central, and a jumping off place for the Whitsunday islands. A walk along the main street will take you past backpacker accommodation, bars and tour offices offering everything for the visitor – from bareboat charters to day trips to the famous outer reef of the Great Barrier Reef. But super casual Airlie Beach these days is a destination for more than backpackers, upmarket accommodation has sprung up to cater for the more cashed-up tourist who is staying longer and who wants to use Airlie Beach as a base for day trips around the Whitsundays. Stylish resort hotels and apartments now crowd the water’s edge and climb the hill which rises from the beach. Other accommodation options include bed-and-breakfast, motel and camping and caravan parks. Traditionally, Airlie Beach has been an overnight stop on the way to and from an island resort or a boat charter. But today visitors are staying longer and using the town more as a base for day tripping. Topping the list of things to do is, of course, a day trip to the spectacular Great Barrier Reef, one of the world’s great wonders and a major Australian tourist destination. It is about 50 nautical miles off the coast – about a two-hour trip by fast catamaran. You can enjoy the exhilaration of a snorkel or dive, or for the less adventurous, see the stunning reef from a glass-bottom boat or even undersea viewing chamber. Another popular day trip is to Whitehaven Beach, one of the most stunning natural features of the Whitsundays. Acclaimed as one of the world’s most beautiful beaches, Whitehaven stretches seven kilometres. Its pristine white silica sands are lapped by crystal-clear aqua waters. If you want to sample some island life, another day trip takes you on visits to up to four resort islands. You can see the islands from a fast speedboat or from a more leisurely sailing boat. A popular holiday is aboard a sailing boat, either with a crew or bareboat where you crew the yacht yourself. In fact, the Whitsundays is home to the southern hemisphere’s largest fleet of skippered and chartered vessels. Being inside the reef, the waters around the islands are generally calm, making it some of the best sailing waters in Australia. You do not need formal qualifications to skipper your own yacht. A feature of the Airlie Beach foreshore is its man-made lagoon, a great place to take a dip without the fear of meeting deadly stingers found in waters around the Whitsundays at certain times of the year. A great, 3km boardwalk takes you past the lagoon and along the waterfront. Before the day is done, enjoy a sunset cruise while sipping a cool drink. For dinner, you cannot go past Fish D’Vine on Airlie Beach’s main street. The food is absolutely superb and at reasonable prices $25-$30 for a main. The café-style diner employs its own fisherman, so the specials feature fresh fish caught that day. The café also specialises as a rum bar. Barman Mark is the expert and he tells me he has 282 different rum brands behind the bar. As he mixes me a great Mojito, Mark says Sir Francis Drake mentions the recipe in his diaries. Outside Airlie Beach, Cedar Creek Falls, 30km away, is a popular picnic spot and swimming hole. And on your way out – at Proserpine – stop at Colour Me Crazy, a funky, oh-so-colourful shop in a Proserpine sidestreet. Robin, the bubbly and eccentric owner, has travelled the world to find a fabulous array of jewels, handmade treasures, stuff to dress up in, leather bags and a whole lot more. Shoppers come from around Australia and the world to find stuff here that is no found anywhere else. The writer was a guest of Tourism Whitsundays. 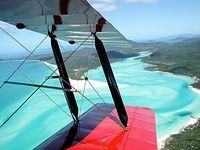 The Whitsundays are serviced by two domestic airports, Hamilton Island and Whitsunday Coast Airport on the mainland at Proserpine. Jetstar, Qantas and Virgin Blue operate services from all major Australian cities. By road, the Whitsundays are reached from the Bruce Highway, turning off 1km north of Proserpine, 20km from Airlie Beach. Queensland Rail’s services depart Brisbane and Proserpine several times weekly. Several coach services also operate daily through Airlie Beach from Brisbane and Cairns. More information visit the Tourism Whitsundays website, call 1300 717 407 or see your local travel agent.